As I said in a previous column, Donald Trump’s appointments of John Bolton as National Security Advisor, Gina Haspel as CIA Director, Mike Pompeo as Secretary of State and Nikki Haley as the U.S. Ambassador to the U.N. are the formation of a full-fledged War Cabinet. The signs are ubiquitous that Trump plans to take America to war against Iran and Syria in much the same way that G.W. Bush took us to war against Iraq and Afghanistan. All it will take is another false flag attack that can be blamed on Iran. And now that Trump is up to his eyeballs in legal trouble as an unindicted co-conspirator in ordering his then attorney Michael Cohen to pay hush money to two women Trump had committed adultery with in order to pay for their silence during his campaign for President in 2016, the likelihood that Trump will attack Iran and Syria as a means of taking attention away from his legal troubles grows exponentially. This is a favorite tactic of presidents who are embroiled in serious scandals. Can anyone say Bill Clinton? And here’s the thing: The more war that Trump (or any Republican President) wages around the world, the more evangelical pastors and Christians love him. And if you think that Trump’s paying hush money to hookers during the 2016 campaign will have any serious negative ramifications with evangelical Christians, it won’t. National Christian leaders knew what kind of a moral and ethical degenerate Trump was when they loudly lauded and supported him—and it didn’t matter. Why should it matter now? And rank-and-file evangelicals were so determined to stop Hillary Clinton from being President (for all of the right reasons) that they would have voted for virtually anyone who would have obtained the Republican nomination. It’s a crying shame that evangelicals rejected the candidacy of Rand Paul in 2016—and especially Ron Paul in 2008 and 2012. A crying shame! I tried to warn listeners of my radio talk show on how then President George W. Bush was turning Christian people throughout the United States into warmongers. Because Bush claimed to be a born-again Christian and had successfully garnered the support of so many conservative evangelical Christians, he was able to shift the entire spiritual paradigm of the country. But that’s what wolves in sheep’s clothing do. Phony Christians do more destruction than overt unbelievers. Phony conservatives do more destruction than overt liberals. Ever since the two administrations of G.W. 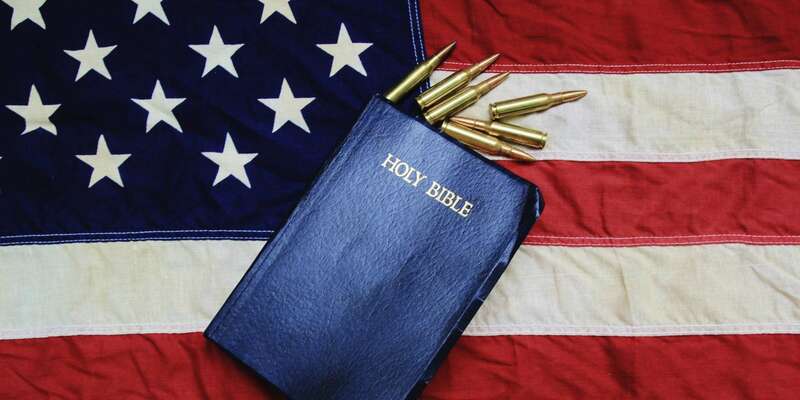 Bush, America’s conservative Christians have become infected with a serious malady; it’s what Laurance Vance correctly calls “Christian war fever.” And the evangelical church in America is eaten up with it. And now that we have another Republican warmonger in the White House, war fever has reached epidemic proportions among evangelical Christians. The United States and its coalition allies have killed hundreds of thousands of innocent men, women and children in its so-called War on Terror. The doctrine of American hegemony (not to mention the globalist/Zionist doctrine of “Greater Israel”) has turned the Middle East into a giant killing field. Through perpetual bombings, drone attacks, missile attacks, etc., President Trump has killed more innocent civilians than ISIS, al-Qaeda, al-Nusra, the Taliban, Muammar Gaddafi, Saddam Hussein and Kim Jong-un combined. And that fact does not take into account the billions of dollars in U.S. weapons sales to terrorist states such as Saudi Arabia and Israel that account for tens of thousands of additional deaths. Barack Obama and G.W. Bush did the same thing, of course. Trump is merely carrying on the same international crimes of empire as did the two presidents that preceded him. And just who are the biggest cheerleaders for war? You guessed it: evangelical Christians. When Donald Trump unjustly, unconstitutionally, illegally and immorally ordered the bombing of Syria for what was clearly a false flag chemical attack in that country, evangelical Christian leaders immediately jumped in to provide spiritual cover for Trump. And this they will continue to do. But in the eyes of the so-called Religious Right, ANY war a Republican president sends the U.S. military into is a just war—no matter how unjust the war really is. Evangelical Christian pastors are unabashed apologists for war. It is safe to say that a majority of conservative Christians have become rabid warmongers. They cheer for war; they promote war; they glorify war; they worship those who wage war; and they enthusiastically vote for neocons like Lindsey Graham and John McCain because of their support for war. For evangelical Christians to talk about the bloodthirstiness of Muslims is laughable. Islamist jihadists don’t hold a candle to the sheer numbers of innocent people who have been killed (and are daily being killed) by the American empire—with the enthusiastic endorsement of evangelicals. At the same time, conservative Christian pastors constantly trumpet more and more war, more and more killing. These pastors would do well to familiarize themselves with the “Gospel of peace” (Romans 10:15; Ephesians 6:15) as proclaimed by the “Prince of Preachers,” Charles Haddon Spurgeon. Some time ago, Laurence Vance published a compilation of excerpts from the famed British Baptist pastor on the subject of the proper Christian attitude regarding war and peace. These sermon excerpts are as germane to Americans today as they were to the citizens of Great Britain in the mid to late 1800’s when Spurgeon delivered them. Charles Haddon Spurgeon (1834–1892) was an English Baptist minister who served as pastor of the Metropolitan Tabernacle in London from 1861 until his death. But Spurgeon was no ordinary minister. He was a pastor, a preacher, a teacher, an author, an editor, and the overseer of a pastor’s college, a Christian literature society, and an orphanage. He is still widely revered today among Baptists (and others as well) as one of the greatest Baptist ministers in history. Spurgeon preached his first sermon as a teenager and, in 1854, was called to the pastorate of the historic New Park Street Church, Southwark, London. During his thirty-eight-year tenure, the church increased from 232 to over 5,000. [And remember, this was in a day when the only attraction to the church was the preaching of God’s Word: no rock music; no smoke; no colored lights; no espresso machines; no twenty-minute sermonettes, etc.] During the remodeling of the Park Street chapel to house the growing congregation, Spurgeon preached at the 5,000-seat Exeter Hall, a public auditorium. But because the remodeled chapel was still too small to accommodate the crowds, the church began construction of the Metropolitan Tabernacle, which sat 5,500 and had standing room for 500 more. In the interim, Spurgeon preached to thousands at the Surrey Gardens Music Hall. He was truly one of the most popular preachers in history. When he died in 1892, 60,000 people filed past his casket in the Tabernacle. Sunday evening sermons. The six volumes of the New Park Street Pulpit (1855–1860) and the fifty-seven volumes of the Metropolitan Tabernacle Pulpit (1861–1917) contain 3,561 sermons, 25 million words, and fill 41,500 pages. Many of these volumes are available online, and most are in print. Unlike some Baptist preachers today who shamelessly serve as spokesmen or apologists for [war], Spurgeon was not the least bit excited about war and war fever. When is the last time you heard words such as these coming from the pulpits of today’s evangelical churches? And when Vance quoted Spurgeon saying, “Many of our bravest soldiers are on the side of peace,” I thought of the words of King David. He said, “I am for peace: but when I speak, they are for war.” (Psalms 120:7 KJV) I know that feeling very well. I am also reminded of the words of Major General Smedley Butler (USMC). General Butler wrote a book entitled War Is A Racket. This book is a classic treatise on why wars are conducted, who profits from them and who pays the price. Few people are as qualified as General Butler to advance the argument encapsulated in his book’s sensational title. When War is a Racket was first published in 1935, Butler was the most decorated American military man of his time—including receiving TWO Congressional Medals of Honor. He had led several successful military operations in the Caribbean and in Central America, as well as in Europe during the First World War. Despite his success and his heroic status, however, Butler came away from these experiences with a deeply troubled view of both the purpose and the results of war. I consider General Butler’s book War Is A Racket to be Must-Reading. The spirit of war will never be extinguished from our country until it is first extinguished from our churches. A sizeable percentage of all of the evangelical/fundamentalist churches in America today are splits and splinters off of other churches. Christians will fight at the drop of a hat. They will split a church at the drop of a hat. They are filled with the spirit of war. But Jesus said, “Blessed are the peacemakers.” (Matthew 5:9) As long as God’s people continue to abandon the spirit of peace and embrace the spirit of war, we will never be able to sing “God Bless America” without abject hypocrisy, knowing that God will never bless those who have willfully abandoned the Heaven-ordained title of peacemaker. Previous Previous post: ROBERT MUELLER: He’s not a Special Counsel, he’s a Deep State hitman and cover-up artist!